Senate Judiciary Committee Chairman Sen. Chuck Grassley (R-Iowa) just confirmed that he will step down from that role and move over to become the new chairman of the Finance Committee. Which means that Lindsey Graham will become the chairman of the Senate Judiciary Committee. And based on Lindsey’s earlier remarks, James Comey and Hillary Clinton are in for a long few years. Lindsey is on record as saying the whole Hillary email debacle needs to be looked at again. We had Loretta Lynch and the tarmac, the servers, Anthony Weiner, we had James Comey doing God knows what…Lindsey wants answers and he is now in a position to get them… come hell or high water. Sen. Lindsey Graham said Tuesday that he will investigate how the FBI handled the investigations into Russian interference in the 2016 elections and Hillary Clinton’s email controversy if he becomes chairman of the Senate Judiciary Committee. Graham has been a longtime critic of the FBI’s handling of those investigations — and has called for a second special counsel to investigate what happened. 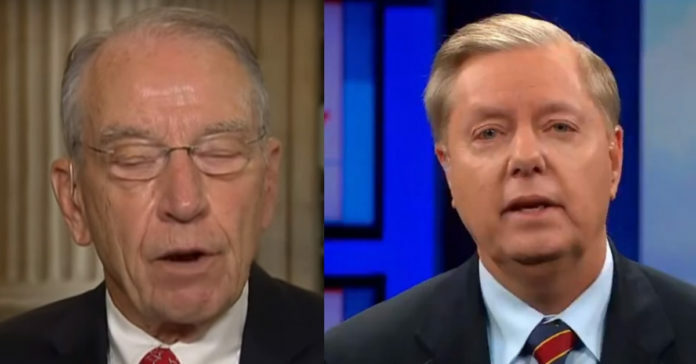 And if Iowa Republican Sen. Chuck Grassley steps aside from running the Senate Judiciary Committee to chair the Senate Finance Committee, as is widely expected, Graham would be poised to run the powerful panel that oversees the FBI. Graham’s comments are the latest sign that the Senate GOP will be a counterbalance of sorts to House Democrats, who plan to end the House Republican probe into the FBI and launch a flurry of new investigations in their new majority next year.